I only ran 6 miles with a 5 minute cooldown for a total of 6.29.Total ran this week was 6.29. I was in a funky mood this week. Tired? Probably, so I took a break. I felt better on Saturday but my body was just not up for running 11 miles. I think I need to review my training plan again. Do I really need to run 11 miles the weekend after a half marathon? I am sure this week will be a great week. No school on Monday, the following week we have teacher institute day on Tuesday, and the the week after that we are off on Monday. Oh yeah, I plan to get all of my workouts too. I cannot wait till Spring Break because I will be going to Riviera Maya. I am looking forward to the warm weather, the non stop drinks by the pool, and the chance to finally relax and not think about work. 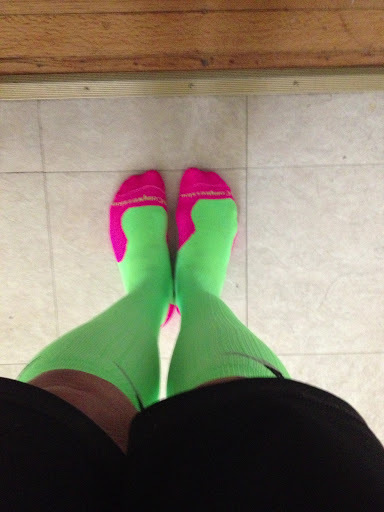 I received these cute Pro Compression socks. Love the color!